interesting version. weird git sound for Jimi. you have believe in coincidences! they're there! @Scraps, @coelacanth, @Rev, what an honor! Thanks for swinging by. @Scraps: Some would say the universe compelled me to play Jimi for his birthday. I wouldn't say that, although I wish I could. @Scraps: Deliberate stupidity is one of my favorite past times. What's this about a lost horse? Mark the Sardine, now that's good advice, @MarktheSardine! Wish I had known you back when I had a horse. another drunken gaucho de llaneros stumbles in.... (ok, not drunken, but wish I was). Cryin' out loud, @MarktheSardine! You gotta let me know about these things. @Ike, you are also good, and I thank you for being here. Will Mr Wish be coming for dinner? Kim reminded me how much I love Jef Gilson, but I got a little too excited and let the finger slip. Oh no! Very generous, @Mark. Clementines, as you know doubt know, are my very favorite. monday is every other day now. Monday it is, @quinn! Hope these tunes make it go down a little easier. Also, if it's any consolation, @coelacanth is right. Monday is, in fact, every other day now. 'Satan' reminding me of Penguin Cafe Orchestra (which I like). Glad to have you, @Mayuko! by the way Sam your image today brings fond memories of one i used to know. 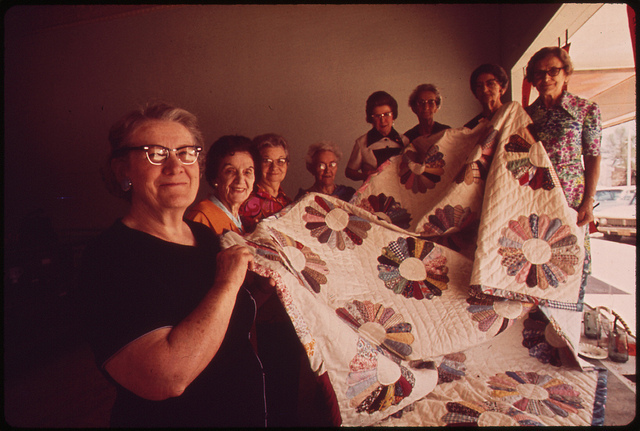 she was in a quilting group and described it quite as that image depicts it - only with her in there, aged about 30 at the time. I love the image you've created in my mind, @coelacanth. @Scraps, you'll definitely get your share of both those greats on this program. Seems I can't go more than a couple weeks without playing something with Mary on it. Bumpy Knuckles into Frankie Knuckles? Don't know what they got Goose from! Thanks Sam, enjoy the night! Peace and thank you, @NGH! But Preacher Man: maybe that is what the Mystery Solved is: the identity of GOOSE! you skip that, you skip the most important part! If only the preacher knew, that up here in Minnesota, we don't play duck duck goose. We play duck duck GREY DUCK, if you can imagine! over by the indian point nuclear facility they play " duck, duck, COVER!" It's always nice to have you as DJ while working on art. Thanks for the show, Sam! Much love, everybody! Thank you so much for tuning in.